Christopher Columbus, cover your ears! This Italian girl is going to tip her hat to the Greek Festival this month and a recipe that is the ultimate Greek comfort food, Manestra! 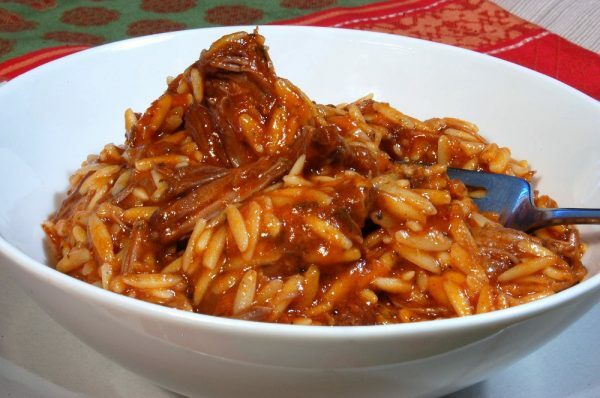 It’s a beautiful pot full of fall-off-the bone short ribs and Orzo pasta. In my Italian family, Orzo was always used as the pastina of choice in our homemade chicken soup, so Greek Manestra was entirely new to me. There’s only one word to describe this hearty meal–“Opa!”It’s that lovely Greek word meaning to celebrate with exuberance, but the ingredients and flavors in Manestra are pure soul-food/comfort food in any nationality. It starts with braised and slow-cooked short ribs that create a fantastic red sauce where you’ll eventually let Orzo pasta soak up all the goodness in the pot! It’s absolutely mouthwatering. For this delectable discovery, I thank popular Valley musicians and recording artists Thano and Demitri Sahnas, known in Arizona as The Sahnas Brothers and Turning Point. Their Mom Kathy Sahnas had a hidden treasure that had been passed down from generation to generation that is so simple and welcoming, I couldn’t wait to dish it up and then get it into your hands! Enjoy the great flavor of this Sahnas family favorite. Generously sprinkle salt and pepper on both sides of short ribs. In a hot skillet with olive oil, brown ribs. When browned, add mint and onion cooking until onions are tender. Add tomato sauce, cinnamon and cloves. Simmer until meat is tender, about 3 hours. When done, remove meat and cut up or shred into bite-sized pieces. Remove and discard cinnamon stick and cloves. Add Orzo to sauce, stirring often to avoid sticking. Cook for about 25 minutes. Add lemon juice. Return meat to pot. In a small saucepan, cook butter until browned. Stir butter into orzo and meat mixture and serve. Serve with a salad and Feta Cheese as a side. Serves approximately 6-8 servings. Jan’s Note: If mixture becomes too thick, add chicken broth or water, a little at a time. In a skillet brown the seasoned short ribs in olive oil. Add onions and mint, cooking until onions are tender. Transfer ribs and onions to crock-pot. Cover meat with tomato sauce, cloves and cinnamon. Cook on high for about 6 hours or until ribs are tender. Remove meat. Cut or shred into bite-sized pieces. Add Orzo to the sauce. Cook for about 20 minutes, stirring occasionally. Add the meat back to the cooked Orzo. Add the melted butter and lemon. Stir and serve.